Mamma mia, what a lazy non-blogger I've been of late! Is there anybody still out there? It's been a crazy month... Luca got promoted at the restaurant and now works approximately 23.5 hours per day, and I have rediscovered the joys of going for aperitivo with colleagues, watching my favourite TV programmes on SKY in English, and - shock horror - playing sport!! A colleague and I have taken to booking a Friday night squash court at a sports centre close to the office, and with the exception of the first week where I managed to paralyse myself from the waist down - it's going pretty well. Hi I thought you had given up blogging, you nearly got deleted from my list the other day, along with a few others. Nice to see you are back. Well I think I would give up on volley ball and do the Salsa, I would love to learn..I think it would be release my stress. I love the sound of the restaurant you tell us about here..any links to it you could add. 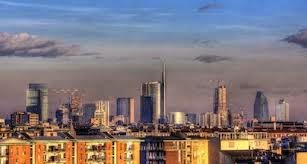 I have a few blogger friends that visit Milan I wonder if they know it!